Date 2009: The lion range has become highly fragmented. I say this in comparing the range set out in the book, Wild Cats Of The World (Sunquists – published 2002) to the map immediately below, which I have made. The embedded map below is accurately taken from the IUCN Red List of Threatened Species™ (Red List) map, which is the most current and is the best we have at August 2009 (as far as I can see). Please note when viewing the map that lion distribution extends to the Gir Forest in north east India, which is also marked on the map. This is the only place outside Africa where the lion is found. 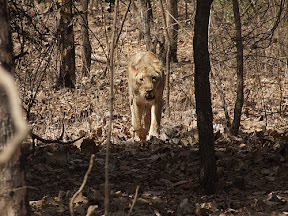 The lion in India is called the Asiatic lion (Panthera leo persica) or the Indian Lion. The map can be moved around in the window by holding down left click on your mouse and dragging the mouse. It can also be zoomed. The blue flags can be clicked to reveal information on the flagged area. This map was an open collaboration map, which means that, although I made it, I had hoped people who are willing and able share their knowledge would refine it. However, this failed to happen. It needs refining for several reasons. Firstly, because the range is constantly shifting (declining in size). Secondly, because there are many small fragments of range and the Red List map doesn’t show the precise position of these fragments. The map I have made using Googe My Maps can and should show the precise area of these small fragments of lion range because Google maps can be zoomed in to a very large scale allowing for great precision. I was not able to do this because the source material prevented it (no criticism of Red List meant by the way). It is worth noting that the Sunquists made a point of saying in their book that the lion is only found in sub-Saharan Africa and the Gir Forest in India and that beforehand some 200 years ago it ranged widely in North Africa, Arabia, the Middle East and in northwestern India. The reduction in size of the lion range has been consistent for hundreds of years and there is no reason to suppose that this long term trend will change. The lion range is very fragmented as can be clearly seen. Vulnerable means a species which is likely to become endangered unless the circumstances threatening its survival and reproduction improve. As the lion’s circumstances, which threat its survival are almost bound to get worse I would have thought we could go to the next category, Endangered. And in reclassifying the lion as endangered, it might help arrest the gradual erosion of the lion’s distribution. I would argue that the IUCN classification system has an impact on conservation and is not merely a means to record threats to survival. For example if the classification is Least Concern the door is open to persecution by people (trapping and fur trade etc.). If the same animal is classified Critically Endangered then more serious steps are taken in respect of conservation. Classification should not be inflated but should encourage conservation because the underlying trend is the gradual extirpation of the wild cats. In about the 1600s the lion was found along the shores of Morocco, which sounds absurd now! By 1911 few survived in Morocco. Lions were also commonly found in Algeria but the last one was shot in 1893 (Sunquist). The story of the shrinking lion range is continual and predictable. What is it like on the ground in the lion range? Lions like the cheetah are more at home is open spaces. The tiger (see Sumatran tiger), leopards and jaguars, for example, prefer forest a less open environment. Lions stalk their prey and use long grass in the open landscape as cover. The length of the grass dictates to a large extent the outcome of the hunt. If it is too long it hinders coordination between lions and if too short it prevents a close approach to the prey, a vital ingredient in the outcome of catching prey. Perhaps for this reason the lion is not one of the best wild cat climbers. That skill goes to cats such as the clouded leopard and margay. 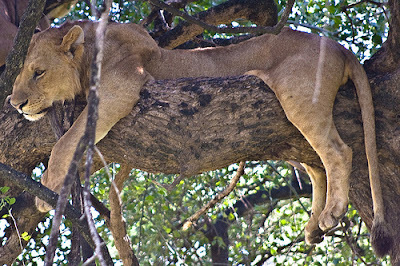 But the picture heading this section shows that some lions do spend time in trees and the lions of Lake Manyare are well known to pass the day resting in the branches of a tree as this photo confirms! Lions (from top clockwise) – in Masai Mara photo by Wildcat Dunny, in Okavango Delta photo by Justin, in Serengeti photo by appenz. The open landscape in these photos is very apparent. Photos: Published under creative commons license. Note: in the collage there has been some slight automatic cropping, which I hope the photographers find acceptable. 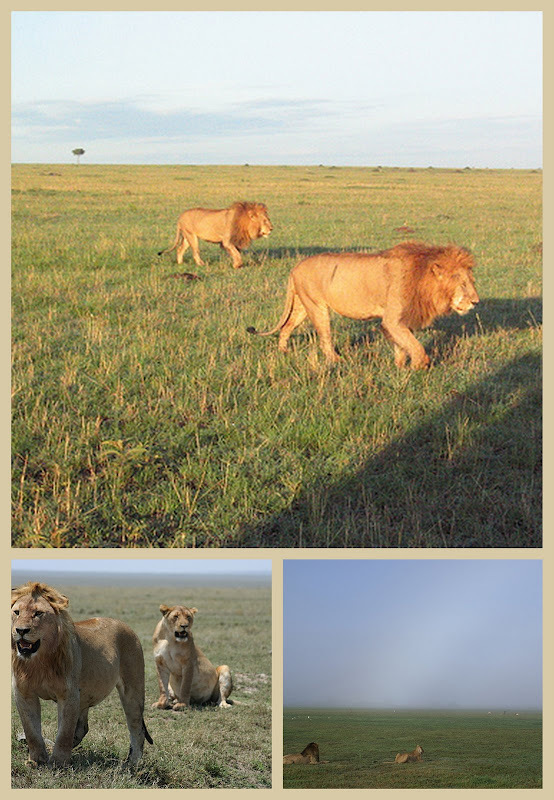 This entry was posted in Lion, Wild Cat Species, Wild Cat Species Range and tagged african lion, lion behavior, lion range, wild cat species by Michael Broad. Bookmark the permalink.